The core directive of our organic growth strategies in developed markets is business expansion that uses as a platform Sompo International that functions to integrate overseas businesses in developed countries in the future.In pursuit of further growth, we will build synergies with Sompo International by reorganizing insurance and reinsurance businesses, integrating underwriting processes, implementing ERM (enterprise risk management), and expanding development through the use of the Sompo Holdings Group’s networks and licenses. Further, focusing on the retail sector, we will use already established business foundations in Brazil, Turkey, and Southeast Asia to achieve growth above the market average. Our policy for conducting overseas M&A is to continue to strike a balance between investments in developed countries and emerging countries. Through discussions at the Overseas M&A Committee chaired by a director with overall responsibility for overseas M&A, as well as other channels, we conduct speedy examinations of investment candidates while remaining disciplined. 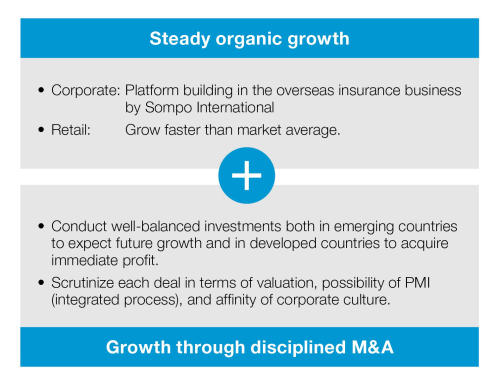 The Sompo Holdings Group positions Sompo International Holdings Ltd. as a platform for its global insurance business, with the intention of expanding its overseas insurance business through the supply of insurance products centered on highly specialized fields. Sompo International has agreed to acquire the operating subsidiaries of Lexon Surety Group, LLC (CEO: David E. Campbell, “Lexon”) in the United States. Lexon possesses a high level of specialist underwriting expertise and a solid broker network in the surety insurance business, which includes “license and permit surety,” a product that aims to ensure that an enterprise active in a legally licensed field is adhering to the legal requirements of such industry, as well as “contract surety” and “subdivision surety,” which are products required mostly by construction companies to engage in work for private and public contracts. Through this acquisition, Sompo International will obtain Lexon’s specialist underwriting expertise and a solid broker network in the surety insurance business, as well as diversify its profit and risk sources. This will further enhance Sompo International’s presence in the U.S. insurance market. On November 1 2017, Sompo International Holdings Ltd. (SIH), a subsidiary of Sompo Holdings, Inc., launched AgriSompo, an integrated platform to provide agriculture insurance across the globe. The new platform will deliver a common underwriting approach with shared expertise and technology across a range of products to farmers, agricultural insurers and a wide variety of other agri-businesses. Based on this platform, SIH will strive to further develop its current business in a number of countries including the United States and China, in conjunction with driving further expansion in the underwriting of agricultural insurance by other overseas Group companies in India, Thailand and elsewhere. Through AgriSompo, the Sompo Holdings Group will contribute to the development of the agriculture sector around the world. Sompo International (SIH) received the transfer of all of the companies in the former Endurance Group on September 27 as a first step toward creating a global platform. Sompo America Holdings, Inc. subsidiaries were transferred under SIH on December 31 and Sompo Japan Nipponkoa Insurance Company of Europe Limited is to be transferred under this plat form in the near future. SIH will use its global platform and global clearance system to set a new global standard of conducting business, providing customers with a wide array of products to help manage their various risks. 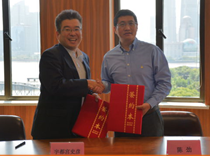 Sompo Holdings's Chinese subsidiary, Sompo Insurance China Co., Ltd., entered an alliance with ZhongAn Online P&C Insurance Co., Ltd. ("ZhongAn Insurance") in June 2017 to jointly develop overseas travel insurance products for Chinese travelers visiting Japan. ZhongAn Insurance was established through an investment by leading Chinese IT firms Alibaba Group Holding Limited and Tencent Holdings Limited., among others, as China's first purely Internet-based insurance company. The new service will combine ZhongAn Insurance's advanced insurance service based on its digital technology and its brand capabilities with the Sompo Group's network of medical institutions and medical interpreting services to provide the highest quality services to contribute to the security, health and wellbeing of customers.